Woohoo! It's two Wordless Wednesday posts in a week. I accidentally posted this week's on Monday and took it back down. 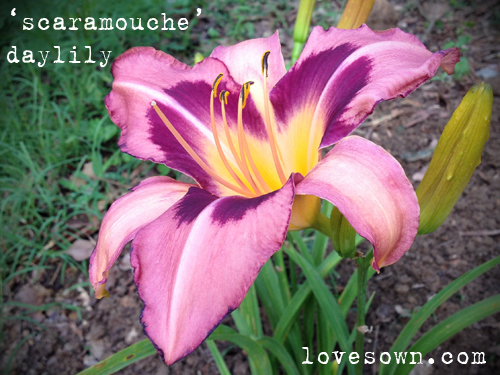 Lest you feel cheated, and lest these are no longer blooming next week, here is our latest daylily addition: 'Scaramouche'. I love this daylily. Wish I could come over and trade you a bulb of something for it. I can't wait to see its return! I don't remember which plants are which at this point, but I see some have sent up blossoms, so it's only a matter of time. I've got tons of various daylilies around the mailbox and will probably need to spread things out some by the end of the season. Do you know if the tubers can be split and dried and shipped? I'm assuming so since you can buy the bare root kinds in Lowes.